Equity repo is different from its more well-known cousin, government bond repo: the operations of the trade are the same but the collateral and the rationale for engagement can vary widely. This overlap of product structure means that both collateral sets can be included in tri-party repo services, but that new services are developing to service equity repo specifically. A guest post from SIX Securities Services. Market participants engage in equity repo to fund internally held positions and to borrow securities for shorting. As a funding strategy, a client may borrow cash on margin from a broker in order to purchase long securities. These securities may be rehypothecated by the broker to replace the cash lent out. Brokers can turn to securities lending or repo markets to lend out securities; the reasons for choosing one or the other depend on counterparty demand, legal agreements, and relationships. As a borrowing strategy, counterparties may seek to take in equity securities as a cash investment. This typically works best for an index, ETF, or other specific set of securities that are easy to define in a collateral schedule. According to the June 2017 ICMA European repo market survey, equities comprised 12% of tri-party repo collateral held, as analysed by type of asset (see Exhibit 1). This market size is similar to public/sub-national government repo at 15%, and smaller than corporate bonds at 21%. European equity repo is more popular than elsewhere in the world; in the US, equities account for only 6.6% of the total tri-party market. In our client experience, we find that the two main objectives of equity repo traders are liquidity and ease of operations, typically referred to as straight-through processing (STP). This is driving new adoption of technology and integration with existing platforms to meet the industry’s drive to do more with less manual processing. 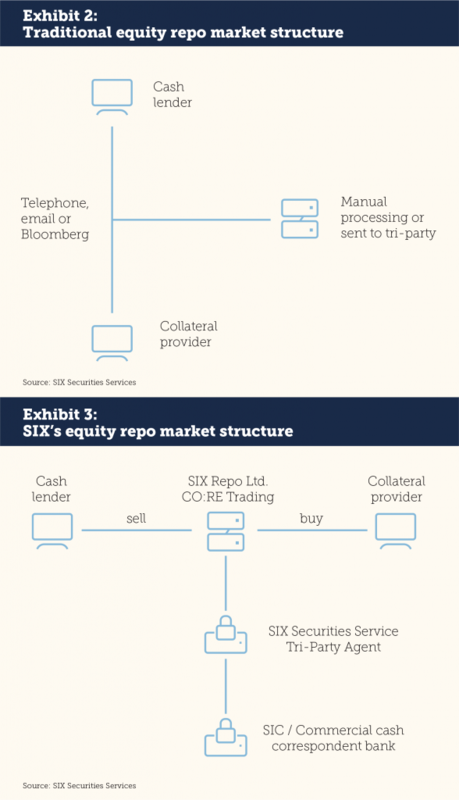 The equity repo market has changed sufficiently in the last three years that it is fair to call it new altogether, at least from a technology and processing perspective. The old market was bilateral: counterparties would call, email, or send Bloomberg messages to each other to confirm pricing and availability (see Exhibit 2). Transactions would be completed either bilaterally or using a tri-party facility. This older market structure worked fine until regulations ended the ability of banks to trade repo with little consideration to balance sheet. The impacts to European repo in general of recent regulatory changes and central bank Quantitative Easing are well known: less liquidity; a transition away from risk and towards low market exposure; and sharp collateral shortages especially at quarter and year end periods. While government repo has a range of electronic options, there has been little on offer for equity repo market participants. The European repo markets needed something new. The new market features a trading screen dedicated to equity repo across multiple products (see Exhibit 3). In our case, we offer electronic market quotations across Swiss, German, Spanish, French, UK, and US equities. The ability to instantly see where liquidity lies electronically instead of hunting for it via bilateral conversations is an important step forward for this market. Integration with a variety of front- and back-ends is also critical: STP reduces human error and maximises opportunities for electronic trade validation, operations, and valuation whilst reducing transaction and overall operational costs to offset increased regulatory cost pressures. Equity repo is not alone in the trend towards greater STP; this is common throughout the financial services industry. There is some debate about whether one counterparty contract or Master Repo Agreement is preferred by market participants or if it is better to have multiple bilateral agreements. In the electronic market environment, market participants have found that one counterparty contract is the best option. This allows all market participants to accept the same rules and promotes optimal liquidity throughout the system. Some counterparties do still like customised agreements as they can alter collateral terms to fit their specific needs, although collateral schedules continue to be agreed (in electronic form) with each individual counterparty. This will be a viable business model until the day when enough liquidity is available on standardised contracts that bilateral, bespoke models are no longer necessary. Customised agreements limit the number of counterparties that can be traded with; consider the time it takes simply to negotiate a customised agreement when assessing how many new counterparties can be created during a year. It’s important to point out that electronic markets do not necessarily mean central clearing. Electronic markets aggregate liquidity and facilitate STP, but the actual credit exposure can remain bilateral or can be transferred to a CCP. At SIX, we support the bilateral model and find that our clients appreciate this option. Remaining bilateral, with tri-party for operations and valuation, means that each counterparty maintains their own rights in the trade. Collateral is not committed for the term, after all, CCPs can and have changed collateral requirements mid-trade leading to large margin calls. In addition, there is no obligation to bail out a failed CCP clearing member — every party is responsible for their own credit and exposures. And there are no guarantee funds that must be posted. The only obligation in a tri-party bilateral market is the transfer of collateral. Tri-party drives efficiency in the bilateral market by reducing operational risks through multiple mark to markets during the day and automatically adjusting collateral requirements. This in turn frees up time for traders to focus on the essential tasks of trading. One argument in favour of CCPs is multilateral netting, and this can be meaningful if a counterparty is both borrowing and lending securities or cash. This can happen most often in government bond markets that tend to be liquid; in one US study, dealers were able to bilaterally net 63% of their US Treasury repo exposure, and could net 81% if non-dealers were allowed on CCPs. Without netting however, CCPs can prove a more expensive proposition than bilateral transactions. CCPs require matching duration and collateral for netting, otherwise participants are simply posting margin on individual positions. In equity repo, netting would be helpful if the same counterparty is borrowing cash to fund positions while also lending cash for investment purposes; in a case where a bank is making a market by both borrowing and lending cash for a spread, netting might provide a specific benefit. Equity repo however does not have the same type of supply and demand characteristics; most participants are long either cash or securities, not both. A CCP would wind up adding extra costs due to low netting rates. Contract standardisation is of paramount importance when it comes to: ease of access, particularly with a large number of counterparties; facilitating intermediation; and reducing the contractual work that needs to go into all agreements for all counterparties. In addition, a fully flexible and configurable set up on the product side is imperative in order to support different requirements for different clients. The ability to tailor baskets according to the needs of the counterparties (particularly with regard to composition: main index equities, blend different indices, or individual ISINS), haircuts, and currencies on offer allows for the largest flexibility to execute transactions and meet the underlying funding or borrowing requirements. SIX as a trading platform and tri-party provider mitigates operational risk in the process by ensuring that cash and collateral is only exchanged upon sufficient and correct availability of the eligible collateral and cash. We ensure that intraday market moves are covered through a mark to market process three times daily whilst constantly checking availability of cash and collateral at the counterparties’ depots. SIX insources a number of activities: managing equity repo positions bilaterally, monitoring haircuts and available collateral, and upon demand creating the required basket or baskets as well as the individual ISINs, leaving the counterparties to focus on the main business of trading. The continuous development of the trading platform and tri-party agent will be conducive to mobilise further assets with the introduction of electronic collateral schedules that create automatic eligibility and baskets without any need for SIX to intervene in the process. To further stimulate asset mobility, a custody agnostic structure will ensure that assets can be mobilised in good time across any given location irrespective of their place of custody — whether at another CSD, ICSD or custodian. The overall STP process from trade conclusion at the platform level, with its benefits of price discovery and access to a large counterparty pool, to tri-party collateralisation and custody, significantly simplifies the cumbersome process of administering and monitoring bilateral equity repo transactions or any non-government securities repo transactions (Supras, Corp Bonds etc). 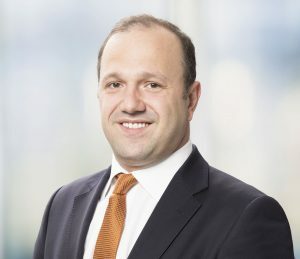 Nikola Todorovic is Head of Sales and Relationship Management for Securities Finance at SIX Securities Services. He is responsible for building out the business through new client acquisition and partnerships as well as maintaining existing client relationships in EMEA. Nik has been at SIX Securities Services for the past seven years and responsible for Sales and Relationship Management for the past three years. Previously Nik worked in client service roles at ABN Amro Mellon, NYSE Euronext and Aramid Capital Partners.